Anyone can become a Audio Publisher! I recently picked up two books from Matthew Chan. The first book being Vol. 1 of his new Turnkey Publishing Series and Vol 2. which shows you how to create and self publish audio books and programs. To the best of my knowledge, I have never seen a book that covers the topic of creating and producing your own audio book or program. This makes this book quite unique on that standard alone. Besides being an excellent resource on producing audio content. 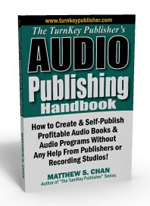 Matthew Chan shows you step by step how to create an audio book or program using his turnkey system. This book really opened my eyes to a world I never thought of exploring. I, like most people tend to think in terms of writing books when the word publishing is mentioning, but that isn’t the case any more. Audio publishing allows you to use nothing more then your voice and some software to create and publish your content. A lot of people have this strange idea that it cost a lot of money to create and publish audio titles, but this couldn’t be further from the truth. Matthew Chan shows you exactly what you need to get started and shares his entire system. One of the tips that I found most useful was taking a simple seminar your performing and recording it. Once you record it, edit it and then you have a product. At the end of the day I think what will make this book stand out isn’t the review or nicely designed cover. I think the book will stand out because it gives normal, everyday people the knowledge and ability to become a published author without the help of the big publishing companies. It puts the power of your project back into your hands and allows you to be heard no matter what other people think. Overall, the book is well written and gives you step by step instructions from the beginning all the way to the end. 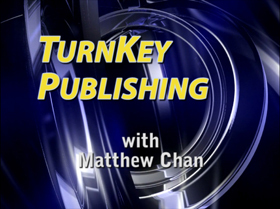 Matthew will take you inside his publishing business and show you exactly how he creates his titles. I was really surprised at how easy it is to produce an audio title and thanks to this course I’m on the way to producing my first one. If your one of those technical people don’t worry because you’ll learn about the software you need, vendors, cover designs, editing tips and a lot more. I highly recommend this book and every author or publisher should think about doing some audio work. You’ll be shocked at how easy it can be. This book is part of the series on “The Publisher’s Turnkey” series for those who anticipate self-publishing. Mr Chan clearly has experience in all the areas he comments on, but the equipment he recommends are at the low end and will not produce the kind of quality that will set a person apart in the audio world. I had already purchased my equipment on the recommendation of someone who had engineered for audio books, and the equipment I ended up with is a little easier to use, but much more powerful in editing. Otherwise the material was well presented and organized for reference. He showed anyone who wants to become a publisher, both for books and audio pieces, how it can be done at a reasonable price to support a wider business that includes consulting and public speaking. I found the book useful and clear.